School is back in session, the sunset arrives earlier each night, and there is the slightest hint of a chill in the air—summer is drawing to a close in Chattanooga. With the arrival of autumn in the Scenic City, though, the fun is just beginning. Chattanooga’s vibrant foliage and plethora of fall activities should put it at the top of your list of places to visit as we dive into a new season. Here are some of our favorite festivals, attractions, and all-around great places to enjoy the autumnal scenery on your trip to Chattanooga this fall. Chattanooga Oktoberfest : This free German-themed festival held at the Tennessee Pavilion is Chattanooga’s oldest and largest Oktoberfest celebration. The weekend-long event will feature more than 100 local and seasonal brews, as well as authentic German foods. You can practice your polka dancing to the sounds of local oompah bands and see who will win the coveted title of Mr. and Miss Oktoberfest. Beer aside, this event offers fun and games for the whole family. Chattanooga Market : Held at the Tennessee Pavilion every Sunday from March through November, the Chattanooga Market is the go-to for local food and art. You can sip a craft beer while enjoying live music and fare from a selection of diverse food trucks. Be sure to bring a reusable bag or two, as you won’t be able to resist filling it with fresh flowers, ripe produce, pottery, and maybe even some locally made, small-batch hot sauce. With face-painting and ice cream to be had, even your smallest family members will find something to love at the Chattanooga Market. Levitt Amp Chattanooga Music Series : This fall, the Levitt AMP Music Series returns to Chattanooga. The music series features ten weeks of free, live music on the lawn of the Bessie Smith Cultural Center featuring local, regional, and national talent. There will be a wide variety of artists performing an array of musical genres, some familiar, some new. Grab a blanket or a lawn chair to enjoy a relaxing night of live music in the heart of downtown Chattanooga. RiverRocks Chattanooga : RiverRocks is a month-long festival that celebrates the great outdoors with just about every activity imaginable: trail running, cycling, swimming, kayaking, mountain biking, rock climbing, and more. The October festival attracts both professional and amateur athletes from all over to participate in its many events, which begin with the StumpJump 50k and wrap up with the Trailblaze Challenge. The activities range in difficulty level and provide fun for the most serious athletes down to the littlest adventure kids. Throughout the festival there is live music and a joyous atmosphere of celebration as people come together to celebrate Chattanooga’s outdoors. Boo in the Zoo : Perfect for families, Boo in the Zoo is a non-scary way to get in the Halloween spirit. In October, the Chattanooga Zoo holds fun-filled evenings for children and families with activities such as trick-or-treating, hayrides, animal meet-and-greets, costume contests, and much more. Boo in the Zoo is an affordable and exciting way for the whole family to enjoy fall in a unique way. Ruby Falls Haunted Cavern : For some fall fun that is a little more sinister, visit Ruby Falls’ annual Haunted Cavern held throughout the month of October. The attraction has been named one of the top 10 haunted houses in the country, and visitors to Chattanooga are sure to have a memorable experience. Because the theme changes each year, you can visit over and over with the guarantee of being scared anew each time you enter the Haunted Cavern. Guild Hardy Trail : Located just a few minutes from downtown, the Guild Hardy trail is a converted railroad that stretches for about five miles on Lookout Mountain. The wide gradual path is perfect for a gentle stroll on a fall afternoon, and its four access points provide flexibility for time and distance. With its smooth gravel, you can look up at the beautiful foliage all you want without the worry of rocks or roots. Along the trail, you’ll pass Civil War relics, historic sites such as Craven’s House, and you’ll even spot the famed Ruby Falls. Prentice Cooper State Forest : Prentice Cooper is perfect for viewing the beautiful colors of fall because of its quiet remoteness and dense tree coverage. 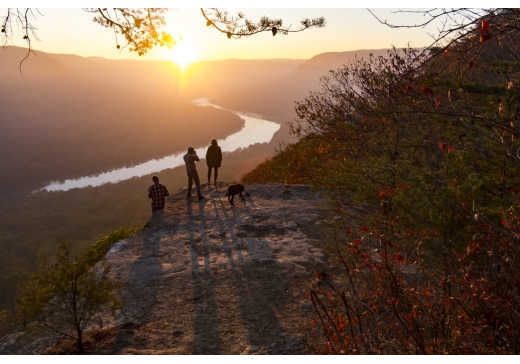 Visitors can enjoy the serenity of the many trails, or catch a spectacular view of the river gorge from the Snoopers Rock and Mullins Cove overlooks. Foliage from the River : In fall, the Southern Belle Riverboat offers boat rides to view the changing leaves from the river. These cruises mean getting gorgeous and unique views of the fall foliage while relaxing on a luxurious watercraft.